Boating doesn't have to be expensive to be fun as Trade-A-Boat staffers Steve Raea and Peter Scarth discovered when they took to the wind-tossed upper reaches of the Tamaki River in Trade-A-Boat's competition boat prize, the versatile Quintrex aluminium 3.75m Dart. It wasn't a great day to be out testing a 3.75 metre open-dinghy but deadlines being what they are meant we had little choice. The forecast southwesterly winds blew in on cue and in no time had built up a pesky little chop. Suddenly, our Quintrex Dart looked very small against a backdrop of thunderheads and whitecaps. Quintrex agent, Auckland Marine Centre's Gary Hatton, was full of encouragement. "Don't worry boys... she's a dry boat... safe as houses," he said, diving for the shelter of his four-wheel drive. I looked at Scarthy (Trade-A-Boat sales manager Peter Scarth) and he looked at me: "Ah, I dunno... do we really need to do this today, I mean, hey, look at it out there." "Shut up Scarthy," I snapped, "just put your life jacket on and get in the boat. And don't jump around too much. Trust me, we'll be fine." "Yeah right," he said, as he gingerly positioned himself in the bow and fiddled nervously with his life jacket. The normally placid upper reaches of Auckland's Tamaki River had taken on a menacing hue as the rain rolled in from the south and white-capped wavelets licked at our hull. "Right then," I said in the dulcet tone of a master mariner, "lets go". The new Mariner 15 hp outboard burst into life on the first pull and we pulled slowly away from the breastwork and out into the windswept bay. The little Dart made light work of the chop as we motored past moored boats tugging at their lines. Little by little we eased on the power until we were up on the plane and skipping freely over the chop. With colour returning in his cheeks and a grin on his face, Scarthy noted in his laconic way that Gary Hatton was right. The little tinny was dry and quiet to boot, with no sign of the bone-jarring slam we would have reasonably expected driving the little boat mercilessly through the chop. With renewed confidence and a growing sense of adventure, we were soon busy throwing the boat left and right at full throttle as we roared our way down river, zig-zagging through a series of vacant pile moorings. As hard as we tried, the little Dart refused let go in the turns, digging in her chine and holding on as if her life depended on it. We both agreed we hadn't had this much fun in years and concurred that boating did not have to be expensive to be fun. In many ways, this was all the boat anyone would need to get out safely and enjoy mile after mile of inshore waterways without the hassle and expense that comes in partnership with the ownership of larger vessels. Tired and dizzy, we stopped mid-river and drifted down with the tide, deliberately moving about the boat in much the same we would if fishing. As a platform, the Dart felt remarkably stable for a boat of its size with only a minimum of roll when placed beam-on to the wavelets. This, we summised, was a safe little boat and lamented the fact we had neglected to pack in the beer essentials. 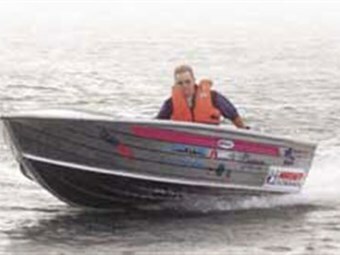 Quintrex, Australia's largest manufacturer of aluminium hulls, make no less than 12 models in the vee bottom open boat category. And there is good reason for it. More people buy this type of boat than any other. 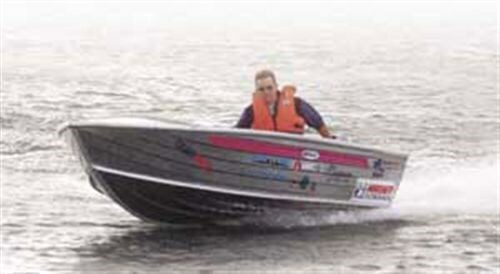 The Dart is a straightforward vee bottom dinghy that is relatively simple in terms of layout and design. The Dart's hull tapers away to a modest vee at the transom which provides plenty of lift while delivering a softness of ride that belies the boat's overall dimensions. Quintrex boasts to be the only aluminium manufacturer to "stretch form" it's aluminium hulls which the company says gives their vee-bottom dinghies a softer and drier riding hull form with better performance all round. Construction methods include the "pressing" of longitudinal ribs into the bottom of the hull. Tonnes of pressure is then applied to chieve a swage or v-strake pressing, giving the hulls the handling and performance of a moulded design but with the lightweight and low-maintenance advantages of aluminium. The Dart employs Quintrex's cross-bracing system for structural rigidity with all joints made with MIG (Mechanical Inert Gas) and TIG (Tungsten Inert Gas) welding for strength and durability. All welds are checked and re-checked as part of the company's quality control procedures. The entire hull is then leak-tested before proceeding to the next manufacturing stage. At 75kg, the Dart is relatively light and was well matched to the 15 hp Mariner outboard which showed no hesitation getting the two of us and our gear onto the plane. While Quintrex recommend a 15 hp outboard, the dinghy will cope with a 20 hp engine provided transom weight does not exceed 51kg. The Dart will carry four passengers comfortably and can be fitted with an optional third foam-filled thwart seat for increased buoyancy and seating. While there is an impressive list of optional extras that run to bimini covers, welded full-length side rails, carpeted floor and painted hulls, the standard package is a complete unit in itself, requiringnothing more than a set of rowlocks and oars to get on the water. The list of standard features is impressive and would embarrass a number of other dinghy manufacturers. These include a moulded plastic glove box in the aft bench seat with built-in drink holders, an anchor shelf in the bow, bow handle, twin stern handles, solid corners and twin bow-eyes. 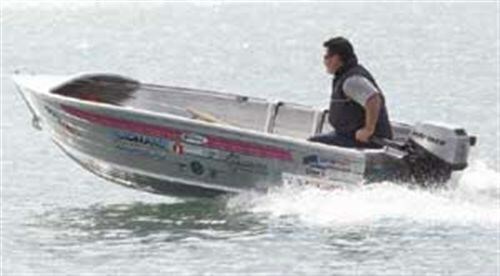 In summary, the Dart is a great little entry-level boat that is both sturdy and strong with excellent load carrying capabilities. It's strong yet lightweight construction means it is easily towed by any vehicle and a breeze to get on and off the trailer. It is the perfect little boat for those who don't want to spent a lot of money on a boat but still want to enjoy a simple boating lifestyle, whether it's weekend fishing, winter duck shooting or a sturdy tender for a commercial work boat.